Above: Visitors Sit Outside the Tea Exchange in Lake Arrowhead. 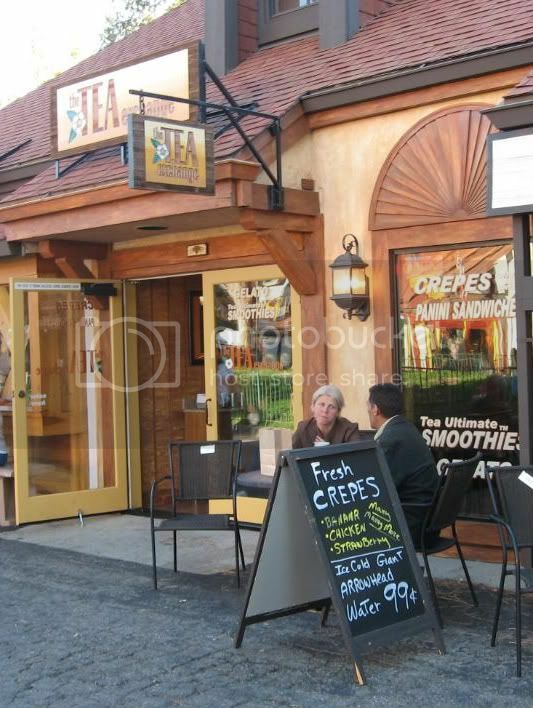 We took a journey over the the other side of the mountain to Lake Arrowhead Village to visit Ginny & Harvey at the Tea Exchange AND to take them up on the offer to sample some of their crepes. The tea was fabulous as usual. This time I sampled their Pirate’s Blend (their best selling tea) and it was lovely. Above: HM ordered a Cherries La Crème Crêpe. But the crêpes–OMG! Unbelievably good. Harvey uses a Hungarian crêpe recipe and the trip across the mountain for those delectables is worth it even if you do nothing else. 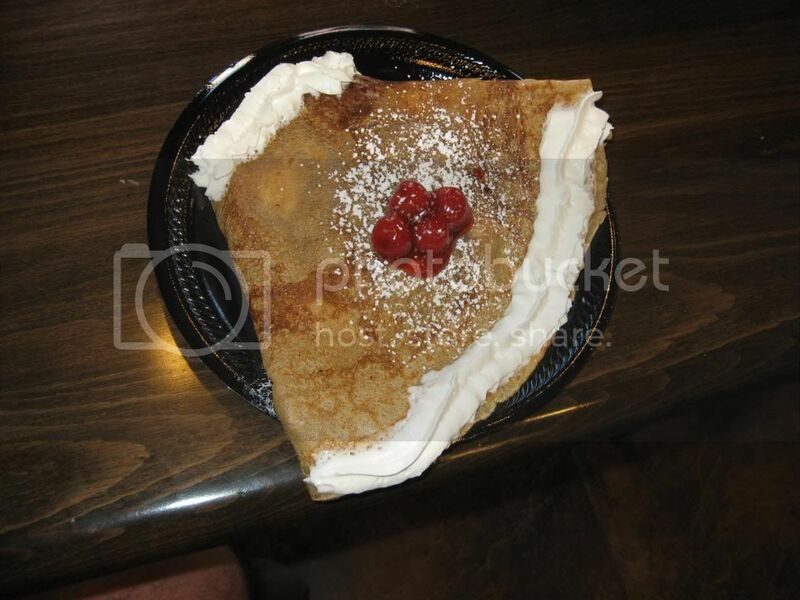 We had eaten lunch at the Bus Stop so opted for some dessert crêpes…my Bananas Foster crêpe was out of this world. While there we also visited with Jessica and Nikita of the Three Dog Bakery. Since Harvey got a new puppy recently we thought we’d urge him to patronize the place for great treats and toys. 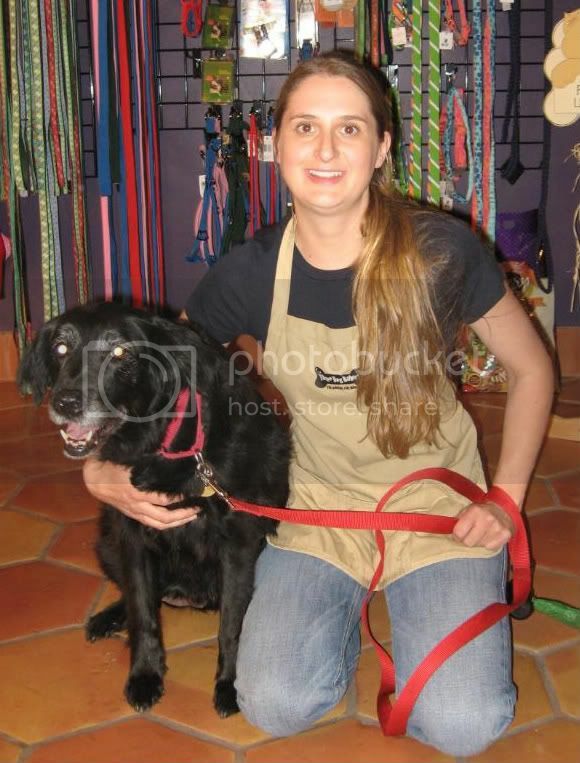 Above: Nikita & Jessica of the Three Dog Bakery. Jessica is the owner and has been there for about a year and a half. Originally a licensed store, it is now an official franchise. I mentioned it before, but Harvey and Ginny are still pondering between licensing stores or franchising the Tea Exchange. 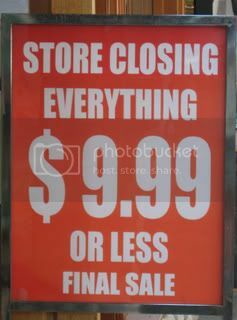 Now those of you who are full-time residents in the mountains know that things have been a bit lean but it was still a surprise to see that several businesses are closing in the Lake Arrowhead Village. Four BIG buildings will be vacated before the end of the year. In Big Bear I heard, and then got confirmation, that Cottage Lane will be closing soon. Despite the tough times, the rents up here on the mountain still remain exorbitant. Huge dollar per square foot plus triple net–what world are these landlords living in? I’d figure it would be better to have a good stable tenant than to have an empty building. This entry was posted on Wednesday, September 24th, 2008 and is filed under Business & Commerce, GG's Day Trips. Just wanted to say thanks for your last article and now an update in this issue! It was such fun visiting with you two and listening to your praise of the crepes! Thanks for all the puppy advice and of course all of Heidi’s treats will come from Three Dog Bakery. Jessica is the best. Just so you know we have had visitors from Palm Springs, Big Bear, Riverside, Temecula, Yorba Linda and Redlands thanks to your article. They said everything you wrote was true, they loved our loose leaf tea selection and our menu. They really liked our drinks they tried while in the shop and one couple said they can’t believe they will be driving up the mountain regularly now just for our crepes! We have already had orders on our website for tea, thanks to your articles. You are the best and you know there will always be drinks and a crepe waiting for you! Thanks for stopping by Ginny. We will be back. Someone was just teasing us last night and urging us to enter a drawing for a gas car since it will be good to fund our trips to Lake Arrowhead!